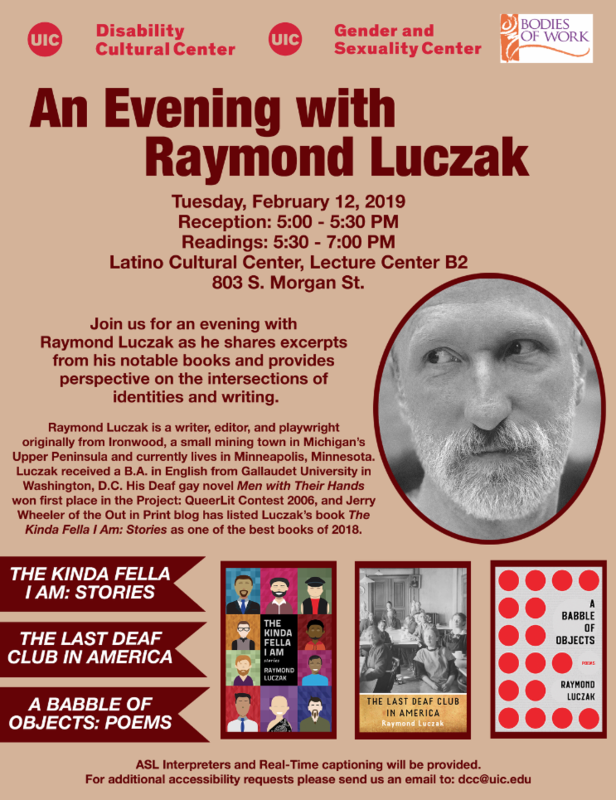 Latino Cultural Center - Lecture Center B2 803 S Morgan St.
Join us for an evening with Raymond Luczak as he shares excerpts from his notable books and provides perspective on the intersection of identities and writing. Raymond Luczak is a writer, editor, and playwright originally from Ironwood, a small mining town in Michigan’s Upper Peninsula and currently lives in Minneapolis, Minnesota. Luczak received a B.A. in English from Gallaudet University in Washington, D.C. His Deaf gay novel, Men with Their Hands won first place in the Project: QueerLit Contest 2006 and Jerry Wheeler of the Out in Print blog has listed Luczak’s book The Kinda Fella I Am: Stories as one of the best books of 2018. ASL Interpreters and Real-Time Captioning will be provided. For additional accessibility requests please send us an email to: dcc@uic.edu.